An epic fantasy tale told with skill and imparting an important message about humanity’s capacity for both senseless violence and great love. The book is a classic Arthurian legend written around the edges of the noble tale of glory that usually occupies the entire story. White appears to have asked himself how a boy raised to be a squire might have lived, and then what the life of a King might be after the cracks in his noble idea being to show. Arthurian legends usually begin with the drawing of the famous sword from the stone, continue through Arthur’s rise to power and end with betrayal by Lancelot. This instead begins, in the first book, with a young boy enjoying his childhood, later joined by the magician Merlin who teaches him about the world by transforming him into various animals and taking him on adventures. There are appearances by an assortment of familiar faces such as Robin Hood, and amusing diversions as the tale wanders in all sorts of directions. When the sword is pulled from the stone the perspective switches to Lancelot’s childhood as he trains to be the ‘best night in the world’ and completely omits Arthur’s coronation and early years as a King. The middle books (for this is a review of all 4) dwell deeply on the relationship between Queen Guineviere and Sir Lancelot, and their love for each-other and also for Arthur, and his love for them both in return. It is truly a love triangle in a way that is not usually explored, but the point is explained so frequently and in so much depth, that you cannot help but feel for all three of them, for in the end none are happy. 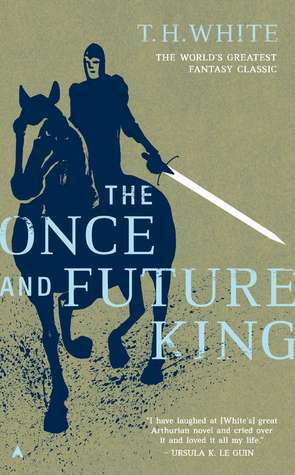 The Once and Future King was first published in the 1930’s written by a conscientious objector during World War II. This history lesson is important, as it deeply colours the story from the beginning, but most vividly in the final volume, where political philosophy takes the fore, rather than actual plot or characters. I can’t help but think as the war was reaching its peak, and White was writing this, that the sense of helplessness and futility he felt when confronted by the senseless slaughter of war spilled out onto the pages. Fiction is often a place where big ideas can be explored and he certainly delves into political history and theory. I think this would lose a lot of readers, and even my attention began to wane by the end, but it was worth it for the concluding sentiment of hope for the human race. This is such a hard series to recommend, but I think it would be enjoyed by those who love Arthurian Legends like I do. All the familiar characters are there, but seen from different perspectives and in different contexts. I listened to the series as audio books, and the narration was excellent, really keeping me engaged in the story when things became deeply political or incredibly off topic. Overall I enjoyed this book, and feel like it was the kind of thing I would have loved even more in my late teens; when the political theory exploration would have been newer to me than after completing a political science degree, and when my obsession with Arthurian legends was at its height. It’s a really fascinating book with lots of information on medieval society. But I would recommend reading some other Arthurian legends first 🙂 thanks for commenting!